Wheel Alignment is a momentous part of your vehicle’s maintenance. It involves regulating the angles of wheels to the position recommended by your car’s manufacturer. At Continental Murrumbeena, we use state-of-the-art tools to ensure that your car wheels are aligned to the manufacturer’s specifications. We also examine your tyres & check for pressure and signs of general wear & tear. Obviously, you can stay confident that you receive exceptional services from Continental Murrumbeena. Whether it is just regular car maintenance or a complex overhaul, feel free to call us at (03) 9579 0007 today. Our service areas include Murrumbeena, Hughesdale, Malvern East, Chadstone, Oakleigh, Bentleigh East & surrounding suburbs. What Does Lead To Misaligned Wheels? Misaligned wheels are usually caused by hitting high curbs on the road or driving over potholes. Excessive abrasion to the mechanical components of suspension and steering systems can also lead to misaligned wheels. If you realise that your vehicle is drifting to right or left while steering or braking, then it is apparent that your wheels are misaligned. Why Should You Get Misaligned Wheels Fixed Quickly? Driving your car with poorly aligned wheels can have an impact on the efficiency of your vehicle’s engine and steering capabilities. It will lead to increased fuel consumption, uneven wear on tyres, poor driving comfort and abnormal wear to the components due to vibration. So, it is necessary to fix the problem as quickly as possible. Our mechanics will help you to align your wheels as early as possible with advanced wheel alignment equipment’s. If not addressed early, misaligned wheels will reduce the rolling competence of your tyres and put your safety at risk. Properly aligned wheels can extend the lifespan of your car tyres and improve your vehicle’s fuel economy. Why Choose Us For Wheel Alignment? Here at Continental Murrumbeena, we are equipped with advanced tools to inspect, diagnose and fix those problems that you may face with your car. 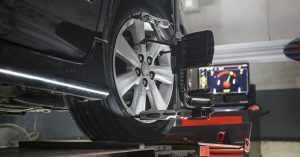 We use a computerised wheel alignment equipment to measure the angle of the tyres and make adjustments in compliance with the manufacturer’s specifications. With a digital wheel balancer, we also fix wheels trembling at higher speeds.